On Nov. 6, Los Angeles (LA) County, Calif., voters voiced support for Measure W, which establishes a parcel tax to fund the county’s Safe Clean Water Program. According to ballot language, the tax would provide approximately $300 million each year to build a retinue of stormwater management infrastructure aimed at bringing the county’s 88 municipalities into compliance with Clean Water Act regulations. Measure W, which requires 66.7% of the vote to pass, leaned 69.4% toward ‘yes’ as of Dec. 3. While the LA County Registrar-Recorder’s office cautioned that a few hundred outstanding ballots still must be counted before results can be certified, county officials celebrated Measure W’s likely passage the morning after Election Day. With exemptions for school districts and low-income seniors, the Safe Clean Water parcel tax would charge landowners 2.5 cents per square foot of impermeable area on their property each year. According to an informational website about the plan, the median obligation would be about $83 annually per property — adding up to an enormous subsidy when collected from more than 10 million residents of the most populous county in the U.S. Supporters of the measure say it will provide water managers the financial flexibility to help meet L.A. County’s Clean Water Act requirements, which have gone unmet for decades. 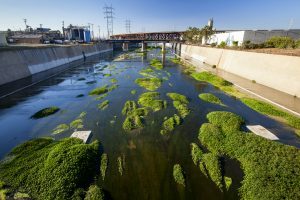 State and federal regulations call for LA County to capture stormwater and purge pollutants before discharging it into waterways to avoid costly fines. According to Sheila Kuehl, chair of the LA County Board of Supervisors, a chronic lack of funding for stormwater infrastructure results in more than 378.5 billion L (100 billion gal) of inadequately treated precipitation reaching waterways each year. While contributing significantly to water pollution, the loss also reduces the amount of water available for reuse, wasting water in a drought-prone region that continues to rely on water importation. If the county continues to fall short of compliance, sanctions by water quality regulators could result in millions or even billions of dollars in penalties by as soon as 2020 that would likely be passed on to taxpayers, according to an October Los Angeles Times opinion piece. If enacted, the parcel tax will take effect beginning in the 2019–2020 fiscal year. To ensure that state officials use collected taxes explicitly to support stormwater management projects, all Measure W revenue will be deposited into a separate fund independently managed by leaders from municipal governments, academia, environmental groups, and the private sector. Per bill language, watershed agencies will receive 50% of Measure W revenue to support regional stormwater projects serving multiple jurisdictions. Individual cities will receive 40% of revenue to finance local-level projects, with the remaining 10% earmarked for the LA County Flood Control District to promote outreach and educational programs. While the state will levy the tax indefinitely without an end date, another Measure W provision restricts the parcel tax from increasing over time. According to the Los Angeles Times, the tax eventually will decrease to cover just ongoing operations and maintenance after construction wraps up on currently planned projects. And for thousands of LA County businesses that already have invested in on-site stormwater management infrastructure, those investments will count toward the property’s parcel tax obligations. “Measure W credits businesses that have made the right investments while finally bringing enforcement and fairness to a system that for too long has favored those who violate it,” the op-ed reads. All told, officials estimate that projects already slated to receive funding under Measure W could triple the amount of water LA County captures annually. Learn more about Measure W at www.safecleanwaterla.org.